As Hurricane Irma neared the Florida Keys in September 2017, the Florida Department of Transportation (FDOT) engaged Global-5 to provide public information support for the Florida 511 Traveler Information System before, during and after the storm. This vital effort was so successful that the National Operations Center of Excellence (NOCoE), an organization that promotes best practices for the transportation systems management and operations (TSMO) community, recently made it the subject of a case study. Global-5’s multifaceted effort included writing and distributing news releases; producing talking points for high-level state officials; developing a media toolkit for emergency management centers; providing system information to FDOT Public Information Officers; and creating social media content, all with the goal of increasing public awareness of an essential source of information during this statewide emergency. The effort paid off. 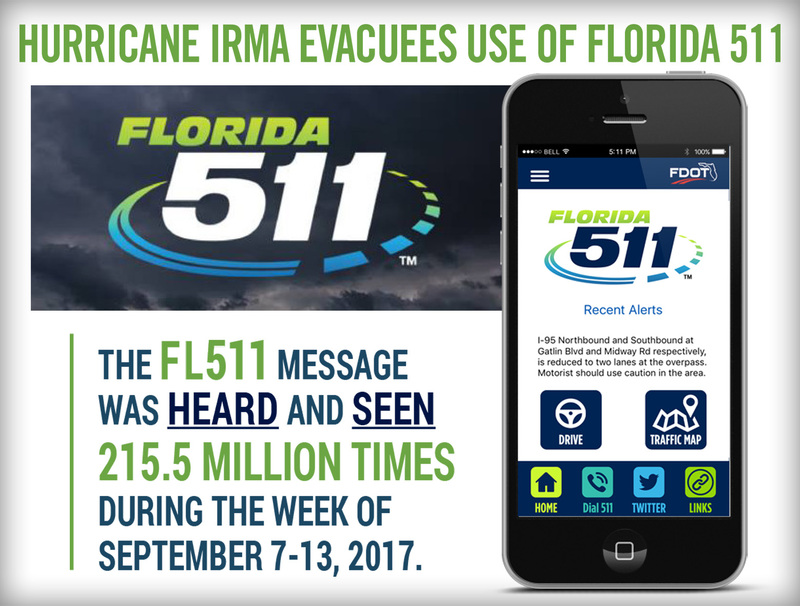 The Florida 511 message was heard and seen 215.5 million times during the week of the storm. Additionally, Global-5’s media relations work generated 584 tweets, 161 news articles in print and online media, and 63 mentions on 25 TV stations, blanketing the state with positive news coverage. As a result, system usage also skyrocketed. The Florida 511 website was visited more than 2 million times, and users accessed the system’s smartphone apps more than 426,000 times. In fact, NOCoE concluded in its case study that Florida 511 became the main go-to source for the most current evacuation information for Florida motorists during the hurricane. Hurricane Irma swept through the entire state of Florida, affecting every one of its 67 counties and prompting the largest evacuation in state history. We at Global-5 are proud of our role in providing the public with important information on road and bridge closures, detour routes, flooding and more, just when Floridians needed it most.